If you take the time to properly organize and store your leftover Christmas gift wrap now, you’ll save yourself time and money come next December! I have a bin that houses all the rolls of paper, gift bags, tissue, ribbon and name tags – it lives under my guest room bed out of the way until I need it each Christmas. 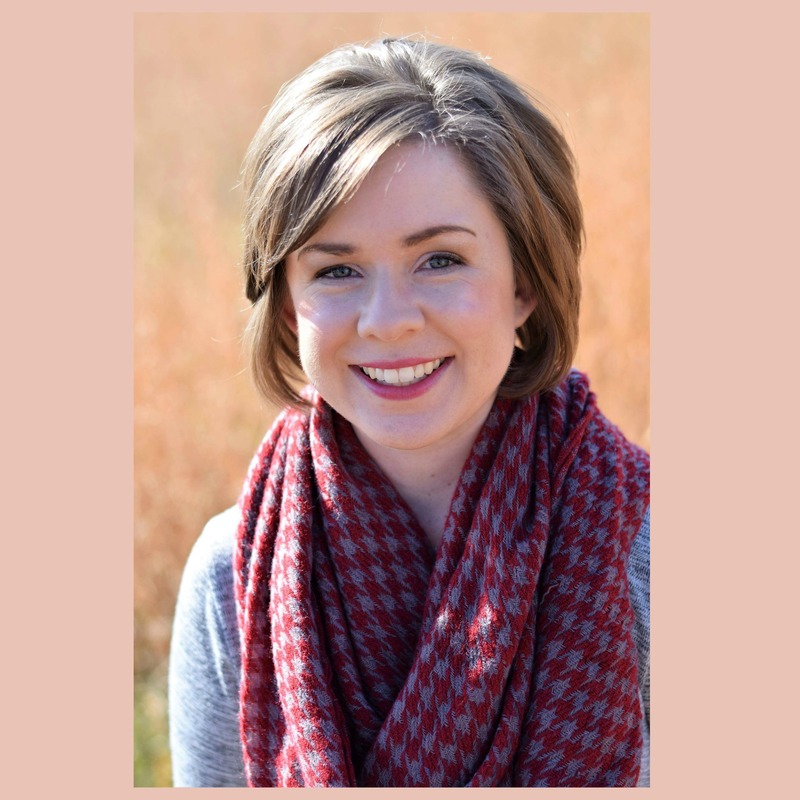 I’ll share a few of my best tips with you today! You could also donate some of those things, if they’re in good condition. 2. Sort similar items and group them in some kind of container. 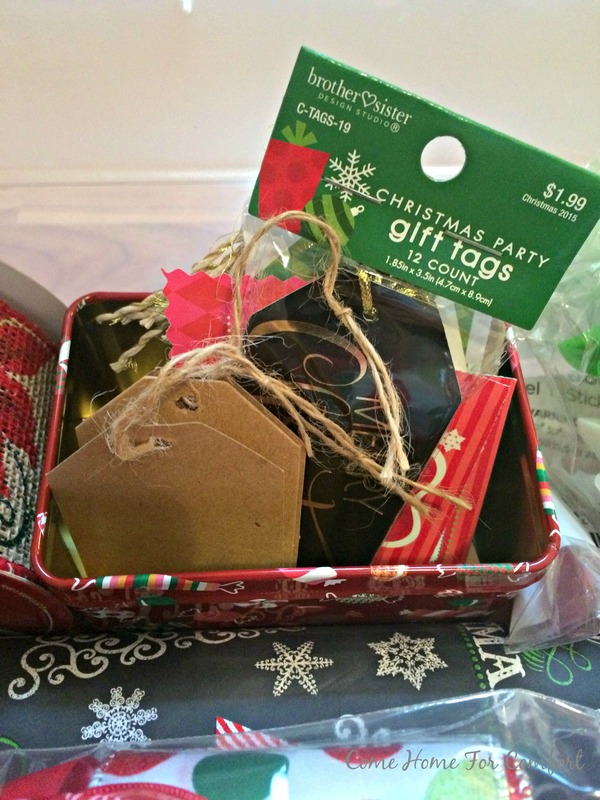 I keep gift tags in a little Christmas tin (both for storage and easy access when wrapping gifts). Extra ribbon from packages I received never goes in the trash if it can be re-used. 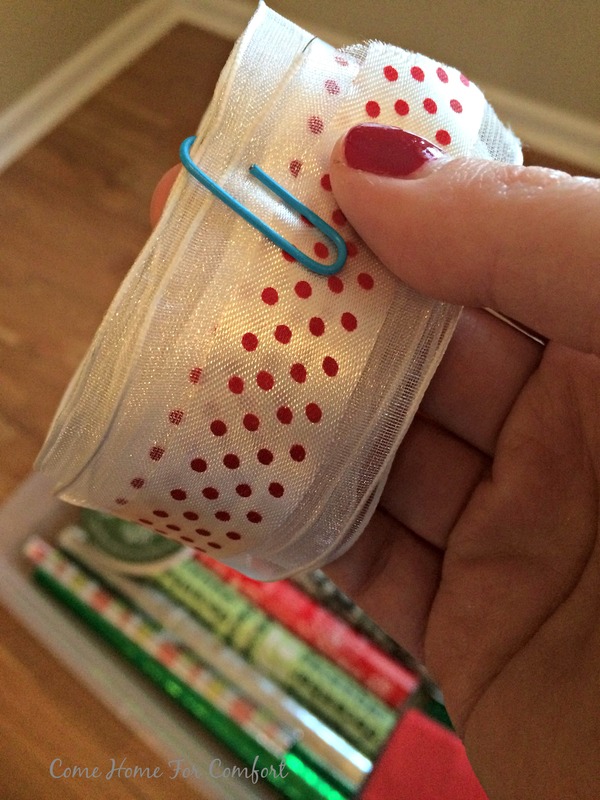 Wired ribbon rolls up nicely, and you can secure plain ribbon in little rolls with a paper clip. 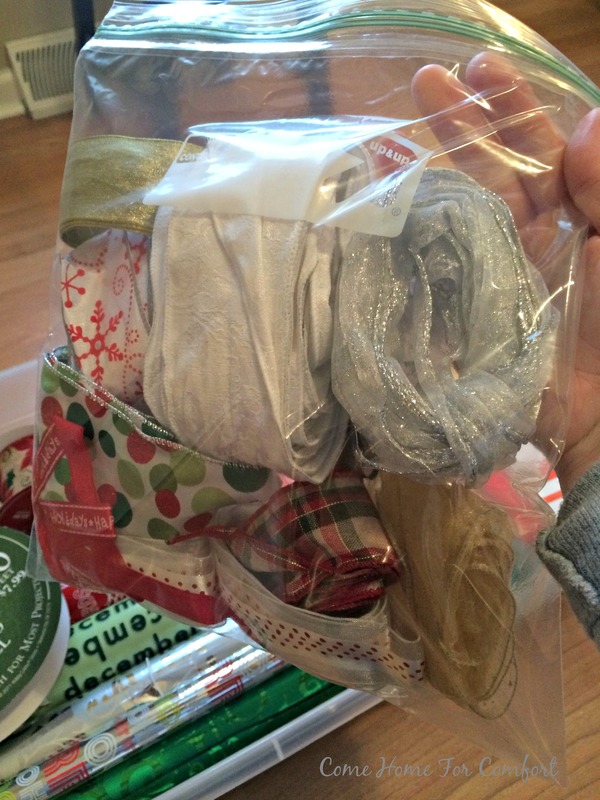 This year I also corralled all the extra ribbon in a freezer bag (thanks to Erica’s tip!). 3. 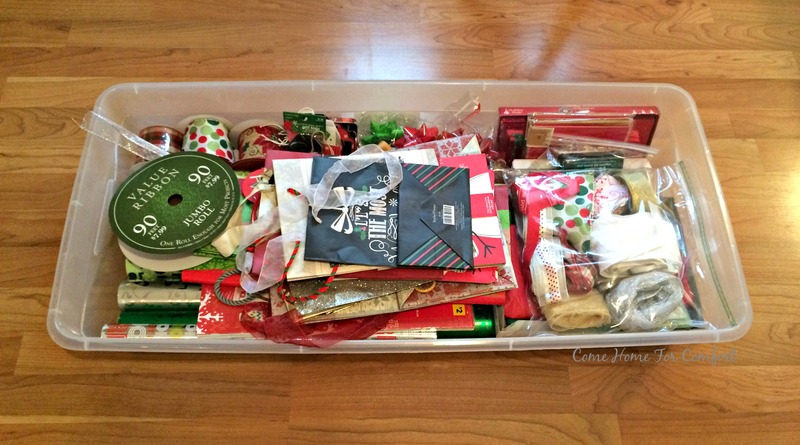 Store all your gift wrapping supplies in one container (if possible). I use a 41 quart rectangular tote – it is long enough to hold my wrapping paper rolls and keeps them from getting wrinkled or torn! If you have a lot of gift wrap, you could store it in a laundry basket tucked away in a closet. I layer everything else on top of the rolls so I can see what I have as soon as I open the lid! 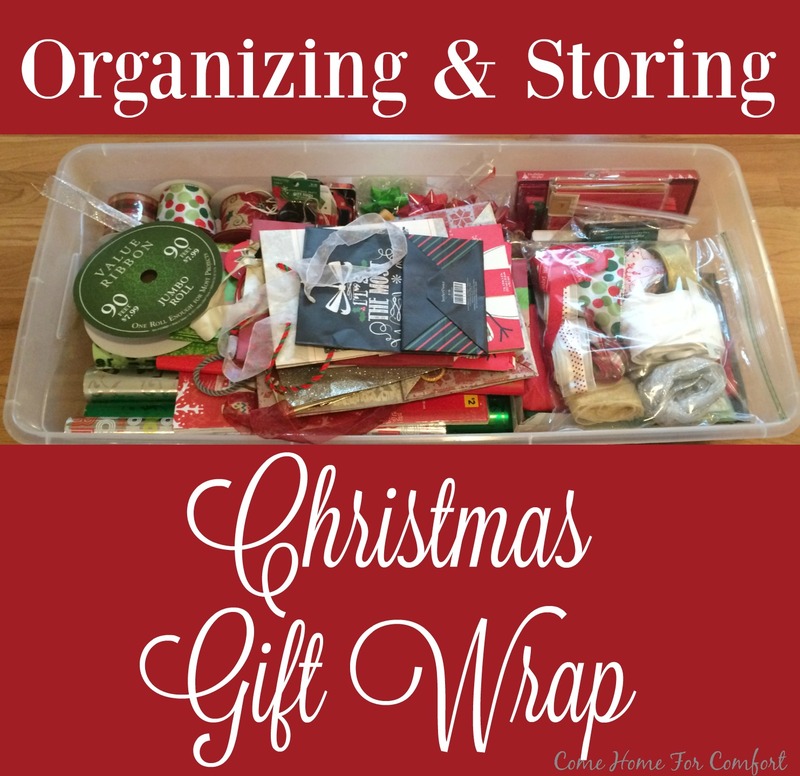 Do you have a system for organizing and storing your gift wrap? If you don’t, I hope I’ve inspired you to try something similar. See you next year, festive paper and ribbons! Next Post High Five For 2015! I have a pantry downstairs that I call the gift closet. I always put items like this in there. I fold tissue paper to re-use, keep bags, etc. I usually throw away boxes though. I probably need to put everything in a tote. You’re always so organized! I have to work hard at it – I’m naturally a hoarder and clutterbug! I use the plastic stand up wrapping paper holder and store it in the garage. I really should take your tip and get rid of tired paper. I tend to keep a plastic bin for bags, boxes and ribbon. Not perfect but works! Loved seeing your Christmas! I think the plastic holder is great for gift wrap! I wish I had a spot for one, but for now mine has to stay under the bed. Thanks, Diana! I use a toilet paper roll split down the middle to cup over the wrapping paper. It keeps it from unrolling. Fun little tidbit! I just need to make it prettier with ribbon or something, but who has time when you’re wrapping presents?! I recognize some ribbon in your picture (that was nice of me!) Ha. That is a really great idea! I will have to do that. My gift wrap is kind of scattered throughout my Christmas totes and my cold room. I have an empty container just like the one you used. 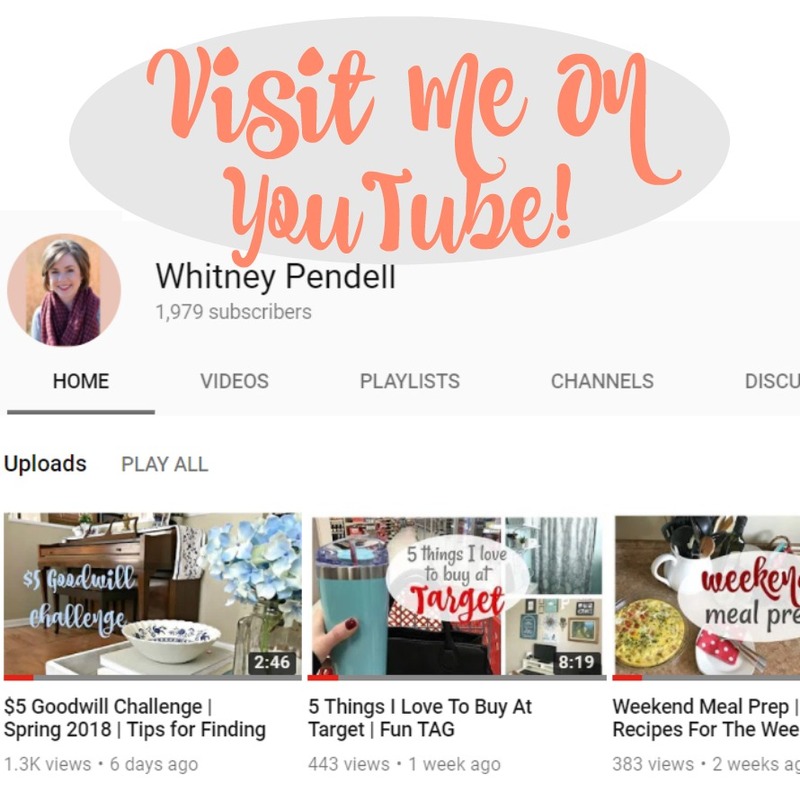 Good tips, as always, Whitney! Happy New Year! It’s nice to have everything all in one spot. Mine is kind of scattered this year. I have the wrapping paper in a bucket, the bags stacked in my laundry room and ribbon in a few different spots. Maybe once we move to a house, I’ll decide on a better system where everything can be in one spot like yours. That is one of my projects for tomorrow Whitney. I also keep a wrapping paper station and I try to keep extra bags, ribbon etch organized and ready to wrap a spur of the moment gift. I keep it in the closet of the guest room so it is out of the way. Hoping 2016 will be a great year for you! !